Earlier this week, William Dyson sat down with Paul Terranova, 2015 USATF Men’s Master Trail Runner of the Year, to talk about the his upcoming race this Sunday (Lost Pines Trail Marathon), his approach to running, and what occupies his mind on long runs other than Justin Bieber. Paul also doles out great advice that’s applicable to new and seasoned runners alike. William Dyson – You’re registered for this Sunday’s Lost Pines Trail Marathon (LPTR). What attracted you to this event? Paul Terranova – It’s a great event that I ran last year. 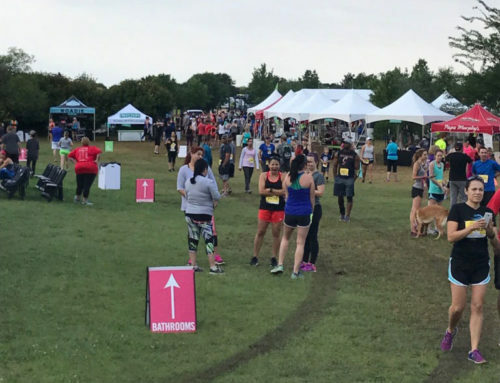 High Five Events does an excellent job with this event at Rocky Hill Ranch and it’s nice to get back on the trails and this challenging terrain. March – May is the time that I’m building up to compete in the Western States 100 (for the 5th year in a row) and Lost Pines fits in well with my training. I also enjoy supporting local events and meeting other local runners. WD – How are you approaching the LPTR from a training standpoint and what are your goals? PT – My goals are to head into Sunday as fresh as possible and maintain consistency throughout the event. Finishing injury-free is always a goal of mine, especially when you’re out on the trail. After my 50-miler last weekend, my approach all week has been to get in some easy swims, relaxed bike rides, and consistent runs. A racing season isn’t built upon one event, but many events, and I look forward to giving a good effort for this race. WD – Goal setting is prevalent throughout your blog (grandkonaslam2012), especially the 2016 Rocky Raccoon 100 USATF Championships (2/6). How vital is goal-setting to you? PT – Goal-setting is extremely important to me. Goals that aren’t written down are just wishes. Until you write your goals down on paper, print them out, see them every day, and have plan(s) formulated you’re just grasping at straws. Setting goals, whether for the season or for a specific race, helps me focus and remain focused throughout. WD – Your mantra is “No excuses, do the work. This I believe.” What type of mental tool can a mantra be for an athlete? When did you first realize this was your mantra? PT – I think this became my mantra around 2007 or 2008. I wanted to push myself to get the most out of these experiences so I’d print the mantra out with a label maker and place it on my handle bars. Having a mantra can be something that pushes you through the hard parts when things aren’t going your way like the weather is crummy or you’re not your normal self. I’ve relied on my mantra and it’s gotten me through tough races and rough training sessions. WD – What motivates you to run, most especially ultra distances? PT – The balance that running brings to my life, my family’s life. It’s a big component of our family. My wife, Meredith, and I beleive daily movement makes us better people. Being able to inspire other people is a great side-benefit. It shows others that you can make time for it too, even into your 40s. What really pushes me during races is competing with the younger guys and making them earn it. WD – In your blog you name-drop Justin Bieber and say his new song gets a lot of airtime in your mind. Beside your mantra and Justin Bieber, what occupies your mind during your races? PT – Being grateful and thankful for being healthy and having the opportunity to race and compete is a constant throughout. Having the amazing support from my wife and my crew and the sacrifices they make to help me out is never forgotten. My most recent 50-miler this past weekend allowed music, so whatever Meredith has on her playlist is what I listen to when music is allowed. I’m also focusing on how fast am I running. Am I going too fast? How’s my nutrition, electrolytes? Navigation is huge too, especially on the trails, you don’t want to miss a turn! And most importantly, paying attention on the trail and not tripping on a root or a rock. Eating dirt isn’t fun! WD – What advice do you have for a first-timer wanting to complete a half marathon or marathon? Ultra-marathon? PT – For someone just starting out I’d say being consistent is critical for training and will prepare you best for race day. Showing up every day and doing something will get you further along than you can imagine; showing up is half the battle. For someone looking to take the next step to ultras, know that it’s a gradual progression. Start off with a trail marathon, then a trail 50K, so you can get a taste of longer distances on varying terrain. Approach it as a long-term campaign; get a couple under your belt before jumping straight into ultra-marathons. WD – What’s your favorite place to run/swim/bike in Austin? PT – Run – Forest Ridge Preserve off 360; Swim – My local Great Hills pool; Bike – Going out to Marble Falls. WD – Paul, thank you for taking the time to meet with me today and talk shop. It was great to learn more about you, your motivation, and your involvement within the running community. We’ll see you out on the trail this Sunday at Rocky Hills Ranch. Good luck! PT – William, thanks for having me. Thanks to High Five Events for bettering our running community and supporting multi-sport events across Texas. Y’all have been supportive of Meredith and I and we’re truly appreciative for that. We’re very excited for High Five’s future and for the local running and tri event scene. See you Sunday! Staying Vertical is an interview session with various individuals within the running/triathlon community hosted by William Dyson, High Five Events Communications Manager. Staying Vertical will showcase the perspective of runners, triathletes, sponsors, partners, event producers, and volunteers and understand what makes them tick. We will highlight their involvement and give the running community an inside look into the individuals that are just like you and I. Know someone who should be interviewed? Contact William, william@highfiveevents.com.